great thread, ill be using these instructions very soon! 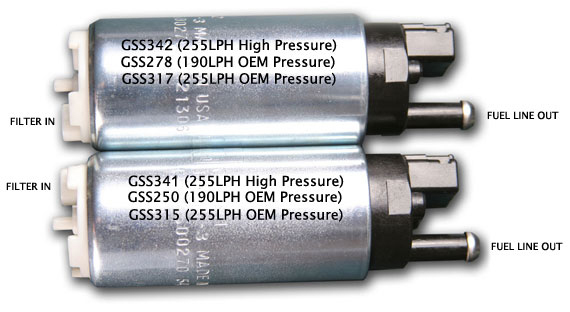 so for those looking for a good stock replacement pump the Gss250 is a perfect choice. Higher flow capacity - and the higher pressure capability allows it to flow even more at higher pressure than the standard. I wouldn't bother replacing the stock pump with the 190 with the GSS342 available. Well if you have a stock car and plan to keep it mostly stock or just intake and exhaust the GSS250 still provides about a 25% increase in flow so why go with such a high flowing pump? plus i read about high pressure problem and having to drill out a swirl ring or something with the 255 pump due to our cars being a returnless system and the link was gone for that MOD so i opted for the 190lph GSS250. so you say you wouldn't bother with this pump, and I wouldn't bother with the GSS342 in my car. I'm adding a Vortech V2 to my 04 sedan 6MT later this month. I'm doing 90% of the mechanical work myself but delivering it to a Osiris shop about 50 miles away for tuning. I'm going to drive it to him with the OE injectors and S/C installed but with no belt. He's going to add the belt, install 550cc injectors and do the tune. Is it safe for me to install the GSS342 and drive it 50 or so miles without damaging anything, including the pump itself? IT SHOULD be ok however there's never a guarantee. Many people have successfully done what you're saying to do. Remember that you have to modify the swirl jet, etc during install if you don't already know about that. ALSO ** If you have the tuner kit (NOT the full kit) I"d advise going with a 340 Aeromotive pump instead. Actually, I'd recommend that regardless from my experience. The Walbro is commonly replicated, so common that I've purchased fake ones from reputable vendors and they didn't even know about it. All around the 340 Pump is a better pump also IMO, and costs around the same, and will help ensure you don't run out of fuel at higher RPM. I can pretty much guarantee you that you'll run out of fuel after 6000 RPM with a 255 pump, tuner kit and anything much under 600 CC injectors. Yikes, well now I'm worried I may have bought a counterfeit Walbro. I'll try it and see. FYI anyone else researching this, the sedan doesn't have a swirl jet. I was having trouble removing the jet pump so I ended up taking it apart. Any idea if I ruined it or if I can put it back together? Like everything on cars probably a hit or miss. The only issue really with anything going back together is how brittle is the plastic and any tabs broken. Reinstall as you took it apart paying attention to detail. My experience with these cars is the plastic and rubber with age really shows. I'm not a hammer mechanic but I broke my coolant bleeder valve and evap purge valve and pcv just in the removal process. So now I don't remove anything I don't have to unless I have that extra part on hand. Replace all o rings, gaskets, washers with new replacements. thanks man. That have me some confidence to try to put the jet pump together and sure enough it was real easy! Nothing was broken. The plastic clip easily latched on to the jet pump and then to the fuel pump assembly !